I never thought I would see anybody die at work. I’m a college teacher, so it’s not like I’m a doctor or a cop or anything. But on student survey day, I found myself in a life-and-death situation. We administer surveys of student opinions one day out of every semester. On these days, I have to stop lecturing fifteen minutes early and leave the room so students won’t be embarrassed when they write all about how I’m the greatest professor they’ve ever had or something. It was because of this uncommon event on this particular day that I walked out of my classroom early and into an almost empty hallway. With my bag slung over my shoulder, I closed the door behind me. That’s when I heard a coworker calling for help and pointing at a fellow teacher standing frozen at the door to his office. I didn’t understand what was happening at first, but I dropped my bag and ran to where he was. I thought his hand was stuck in the door but as I reached him I realized the situation was much worse. He couldn’t move. I half-carried him into his office and got him into a chair, and because of the way I was positioned I ended up kneeling with this stricken man in a sort of half hug. There was commotion and some panic around us as we waited for emergency medical responders. The man was unable to verbalize anything, so I asked the colleague who called for help what his name was. I tried to communicate with him, but nothing worked. His eyes were open with awareness, but his body was betraying him. He squeezed at my shoulder as his only form of communication. Then his eyes went wide and distant. His face paled and his skin chilled. I grabbed his face in both my palms and called for him, tried to bring him back to focus. I steadied his head from rolling and heard gasps behind me. I didn’t know what to do. He wore a bracelet with a saint on it, Simon or Jude I think, and I whispered prayers for him that I hoped he could hear. He never recovered. The medics arrived and rushed him to the hospital, but he succumbed that evening. What at first had seemed to be stroke-like symptoms were actually a powerful heart attack. I did a lot of thinking about life and death after that. I thought about the man who lived so many decades, had so many experiences, yet he spent some of his final moments in the arms of a person he had never met. When you watch someone die you suddenly realize how very much alive you are. I guess in a nutshell, the point is that the more we recognize death, the more we appreciate life. We all have to decide which of those two things will occupy our focus. Clay Morgan is a writer, teacher, and speaker from Pittsburgh, PA who blogs about pop culture, history, and the meaning of life at ClayWrites.com. 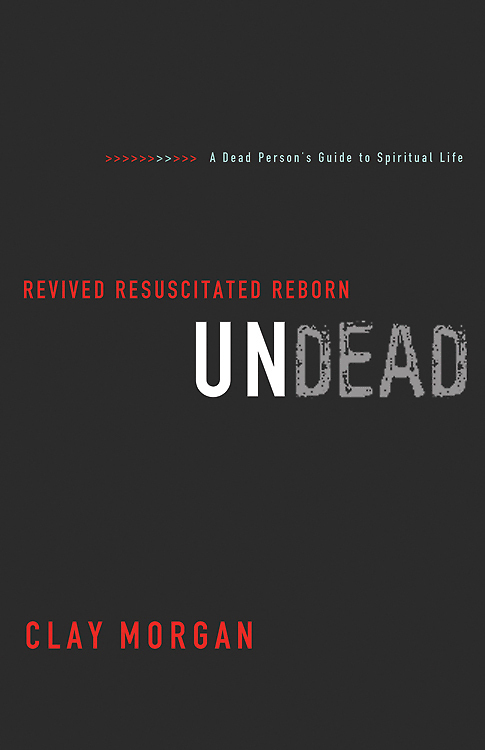 He is the author of Undead: Revived, Resuscitated, and Reborn about zombies, God, and what it means to be truly alive, from which this post is adapted. I’m looking forward to getting Clay’s book and reading it. Love his perspective. Thanks Larry. I appreciate that. I think you’ll like it, Larry. I’d be interested to hear your take on the book. I forwarded this post to my pastor, who is preaching a sermon this Sunday on our cultural fascination with the undead. I thought Clay’s book might be of interest. Thanks for making me aware of this. You are always a wonderful blogger, resource, and thinker! Hi Chad. Man I would like to hear that sermon. Thanks for passing this along! I can’t imagine a moment like that–seeing a life flee the body to depart to a realm beyond these shores. I imagine it’s all at once terrifying, and in a way holy. At least what you did, in trying to provide solace, was holy. I suppose the lesson for me is: be present in every moment of life, for we don’t know when our last one will come.